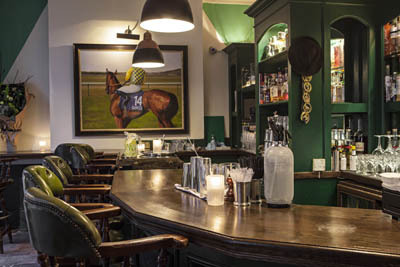 Handily situated just behind Bond Street tube, in the heart of Mayfair lies newly refurbished public house The Running Horse, the oldest pub in Mayfair dating right back to 1738. Taken over by the dynamic duo Dom Jacobs and James Chase (of Chase Distilleries) they have also transformed the upstairs function room into a horse racing themed cocktail bar, stocking all the finest seasonal Chase spirits. Instantly impressive, the stairway is swathed in colourful racing silks with a bright neon sign leading up to The Whip. Make no mistake, this is very much a bar for the racing fan. The menu is set on a quirky racing card, all the cocktails are horse-related (The Frankel Fizz, The Derby Day, The Final Furlong) and there are eleven in total each with their own silk colours and number. The Whip Julep, a mix of Chase rhubarb vodka, Williams Chase GB extra dry gin, Lemon, sugar syrup, mint leaves, basil leaves and soda water was sweet, herbal and refreshing, served in a pewter cup with a traditional sieve like straw. The brilliant and banterous bar tender, Jimmy explained that it was to stop rich race-goers from spilling the contents down their smart attire when having a Julep. You wouldn’t want to waste a drop, that’s for sure. Small nibbles served alongside the cocktails include delectable scallops with chorizo and oysters, oysters six different ways (the best of which was deep-fried with avocado and sorrel), and lamb with mint and cheese lollipops. The Whip at The Running Horse, 50 Davies Street, Mayfair, London, W1K 5JE.